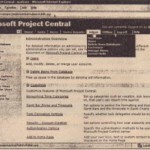 Each person who uses ‘Project Central must have an accollnt. Part of each account is the user name (to identify a specific person) and password (to authenticate that person’s identity). Accounts can be created in a couple of ways. 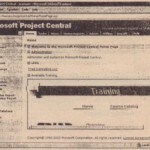 For example, the Project Central administrator will set them up in advance. As a project manager, you can also create accounts for yourself and your team members from within Project 2000 (see “Making Project Data Available to Your Team,” as follows), assuming that the administrator has enabled that setting for you. Creating an account isn’t as simple as entering a name and password, however. T~ensure the security of your company’s sensitive project data, each account has certain permissions granted to it. from within the Project file. 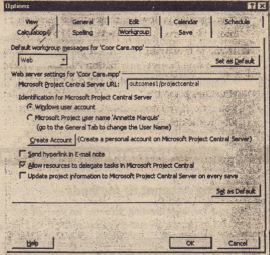 The Project Central administrator has the ability to add and delete accounts and set other users’ permissions. The administrator can even provide other users with administrative permissions. Those with administrative accounts have the ability to customize views, allowing users to see certain areas of projects, based on fields and filters. If you’re a project manager but not an administrator, you may have to coordinate with the Project Central administrator so that your team members have access to all the information you want them to see. In theory, anyone with an account and appropriate permissions can see data in Project Central. However, if you as project manager haven’t updated the project file to the Web server or sent any workgroup messages since the Project Central accounts were set up, users won:t see much when they log on to the Home Page. 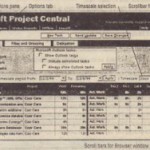 They’ll have no mail messages and no task entries in their tirnesheets, They won’t even be able to see the name of the project unless you configured it for Project Central. So, there are really three general issues controlling what users see: account permissions, Project 2000 file settings, and workgroup messages sent. 1. Click Tools> Options and select the Workgroup tab. 2. Choose Web as the method of communication you want to use for Workgroup messages. 3. 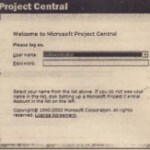 Type the URL for Project Central in the Microsoft Project Central URL field. 4. Choose an identification method (see sidebar that follows these steps). 6. Enable the Send Hyperlink in E-mail Note feature if you want team members to receive a regular email message, with the URLfor Project Central, each time you send workgroup messages. This email is intended to serve as a reminder for resources to log-on to Project Central and retrieve messages. If they’re already doing that on a regular enough basis, .leave the feature disabled. 7. If you want to allow your resources to delegate tasks to other resources in this project file, enable that checkbox. Project Central display the NT user name in the From field. With this option, you have the advantage of being able to use Windows NT security features. The Microsoft Project User Name method (for Microsoft Project Server Central authentication) lets you use the name stored on the General tab of Project’s Options dialog box. Each Project 2000 user can enter whatever name they like. In small companies, first names often suffice,which lends a personal touch to email messages. Of course, standards must be established, or else you’re sure to see messages from the . Until the project manager sends a workgroup message, team members have no messages and no status reports indicated on the Project Central Home Page (like the one shown in Figure 16.2). If you previously used email workgroup messages, responses to those messages show up in your email inbox. After you make the switch to Project Central, any, new TeamAssign, TeamStatus, and Team Update messages you generate as project manager appear in Project Central responses to those messages appear in Project Central as well. As mentioned previously, the Home Page provides the starting point for your work in Project Central. Often, users blow by the Home Page with a single click-to features held on other pages. But certain options are accessible only from the Home Page (or most easily accessible from there). These options include email messages, rules features, and password settings. Project Central’s Home Page indicates when you have new messeges. To view them in list format, click an email link (messages, Microsoft Project Central Inbox, or any of the em ail links in the bar or A pane). The Project Central Inbox for ‘team member Karla Browning’ is shown in Figure 16,3. At this point, the user can type a reply message, as shown previously. (Look for an insertion point toward the middle of your message window above the Original Message text.) But the most important thing the user must do is to change the table to reflect the tasks she cannot accept. The Accept? field has a Yes/No drop-down list that defaults to Yes. Changing the Yesto a No declines the task assignment after the message is sent. After the table is updated, the user clicks Send. The message closes and the original TeamAssign message (to which she was replying: is deleted from her Inbox. 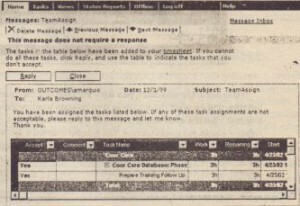 Many of the actions required for responding to Project Central messages are similar. Table 16.1 summarizes what team members should do to reply to different types of mail.